Member of a family of the Prussian landowning aristocracy, he enlisted in the German Army as soon as the war began, being assigned, as befitted his family condition, to the Cavalry weapon, and during the first part of the war he was decorated with a second class Iron Cross. The trench warfare as developed throughout the war made the cavalry weapon almost useless as it had been used in warfare up until that moment. Thus, in 1915 von Richthofen, after a brief passage by the infantry weapon (to which military aviation was in principle attached) requested his transfer to the German Imperial Air Service (Die Fliegertruppen des deutschen Kaiserreiches), later renamed as Luftstreitkräfte. In France he met the best German fighter pilot at the moment, Oswald Boelcke, who would later become his mentor. Von Richthofen was originally assigned to the Kampfgeschwader (Bombing Group) No. 2 flying an Albatros C-III. Although at first he looked like a pilot below the average, he managed to shoot down a French Nieuport on the Verdun front, which was not officially recognized either. After returning to the eastern front, he met again Boelcke on a visit in which the German ace selected him for his fighting squad Jagdestaffel (Jasta) 2. After significantly improving his piloting abilities, his first victory was credited on September 17th 1916 over Cambrai, France. Since that day, and through a Berlin jeweler, he ordered a small silver cup for each enemy aircraft shot down. When he achieved his 60th victory and due to the shortage of silver supply due to the war restrictions, he refused to order cups of lower quality and stopped ordering the trophies. Von Richthofen's fighting style was not spectacular or risky as was that of pilots such as his brother Lothar (40 victories) or Werner Voss; on the contrary and following Boelcke's manual, he attacked from above with the sun on his back and with friendly planes covering the flanks, in order to ensure the success of the mission and the highest possible survival rate for his squadron as a whole. In November of 1916 flying his Albatros D-II he shot down the British ace Lanoe Hawker, VC, whom he called "the English Boelcke". Shortly thereafter he switched to the Albatros D-III, although a break in the lower wing made him return to the D-II and Halberstadt D-II. He was shot down on March 6th, although he managed to land without any personal wounds. He flew again in the Albatros D-III with which he was credited 22 victories, and through several changes to Albatros D-V. In January 1917 after his 16th victory he was awarded the Pour le Mérite medal, the highest German military decoration. That same month, he was appointed head of Jasta 11. He personally recruited the members of his squad among the elite of German pilots, many of whom he had trained, such as Ernst Udet (62 victories) or his own brother Lothar von Richthofen. Once in command of Jasta 11, he took the eccentric decision to paint his plane completely in red, the famous "Rotes Flugzeug" or red plane, being himself known since then as Rote Kampfflieger, or the Red Combat Pilot. Richthofen's unit achieved impressive results: during the so called Bloody April in 1917 they shot down 151 planes against 66 of own losses, including 22 enemy aircrafts shot down by von Richthofen himself (4 in a single day). At that time von Richthofen was performing the duties of a lieutenant colonel being only a captain. The German Army did not promote officers by war merits, but following an established career path. It was also customary for an officer not to hold a rank higher than his father, and von Richthofen's father was at that time a commander in reserve. On July 6th, 1917 and flying over Wervicq (Flanders, Belgium), he was shot down for the second time in his career, and although he managed to land his plane on his own lines, this time the consequences were serious: he received a stray bullet in his head, which caused brain injuries. After a few weeks of convalescence he returned to the front, but according to his squadmates he was no longer the same person: he ceased taking precautions and even forgot Boelcke’s rules or the ones Richthofen himself described in his book Der Rote Kampfflieger, a book he was ordered writing by the German propaganda officers that he wrote with reluctance during his convalescence. Due to his legendary status in Germany, he was suggested to give up flying and fighting: his death in combat could cause a drop in the morale of the German Army and German people. However, von Richthofen rejected a position behind the lines after his serious wound, stating that "any poor devil has to do his job in the trench," and that he should do his own. 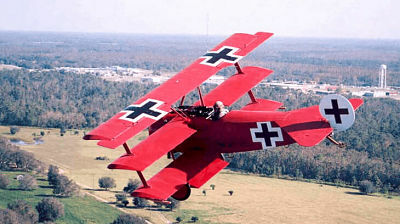 Shortly after his re-entry as commander-in-chief of JG 11 he received a Fokker Dr-1, the famous triplane which he is commonly identified with. The aircraft, which of course was also painted in red, was a very agile one, although if it maintained the fixed course it became an easy target for enemy aircrafts. Richthofen was shot down and killed shortly after 11:00 am on April 21st, 1918 on Vaux-sur-Somme, not far away from Amiens in northern France. He was chasing at low altitude a British Sopwith Camel flown by a rookie pilot, the Canadian Lt. Wilfrid May, near the river Somme. The Canadian had attacked Wolfram von Richthofen’s aircraft, who was Manfred’s cousin and by then an inexperienced pilot who years later became general of the Luftwaffe and who was among the commanders of the Condor Legion during the Spanish Civil War. Until today it is still uncertain who actually shot down the Red Baron: The victory was credited to the RAF’s Canadian pilot Captain Roy Brown, although recent investigations show that the caliber .303 bullet that killed von Richthofen was shot from the ground, and there are several machine gun operators that could make the eventual shot.